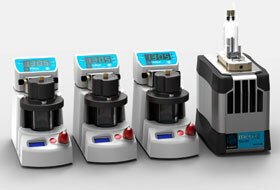 The launch of the µEncapsulator 1 System is set to benefit scientists working on an array of applications, including characterisation of natively paired T cell receptors, isolation of monoclonal antibody coding sequences from blood samples, high throughput single cell expression profiling, droplet PCR, high sensitivity digital PCR and encapsulation in hydrogels. The µEncapsulator can individually encapsulate 300,000 cells into monodisperse droplets in 15 minutes. Samples and reagents are loaded into the 100 µl Sample Reservoir Chip for encapsulation using a 2 Reagent Droplet Chip. The microfluidic droplets produced are then collected in a temperature-controllable microcentrifuge tube for easy aliquoting into PCR tubes or cell culture multiwell plates, or imaging under a microscope. A biocompatible oil with a high dissolved gas content is used for dropletisation, enabling encapsulated live cells to be cultured for days. For ease of use, the system can be controlled using Dolomite’s advanced Flow Control Centre software, enabling a range of protocols to be performed, from simple one-click sample processing and dropletisation through to full automation.